Map courtesy of City of Seattle: A Comp Plan amendment would move an industrial boundary overlay off Seattle Pacific University property north of its campus. The Seattle City Council will consider whether to remove 4.7 acres of Seattle Pacific University property from the Ballard-Interbay Northend Manufacturing/Industrial Center this winter, which would be the first step to opening the land for future campus expansion to the north. 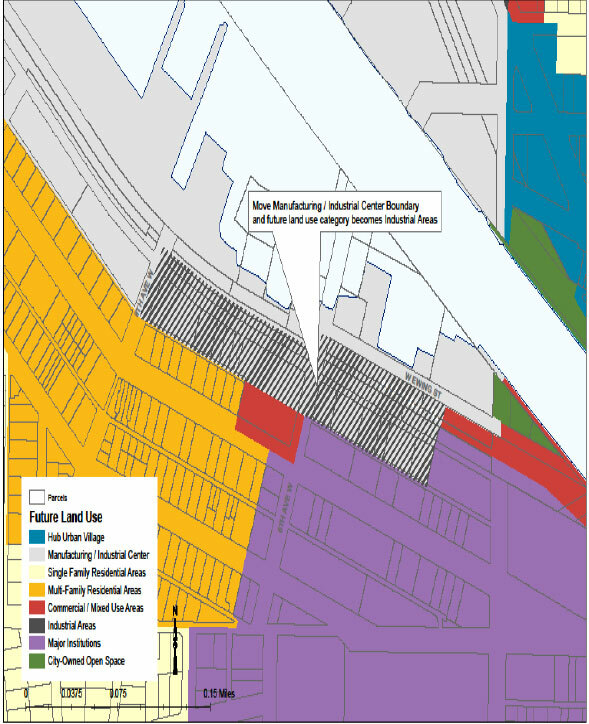 Councilmember Rob Johnson introduced the legislation, which would keep the property at the corner of Eighth Avenue West and West Ewing Street zoned industrial, but remove it from the Ballard-Interbay Northend Manufacturing/Industrial Center in the Future Land Use Map. That would allow for the council to come back later and approve a code change for an overlay that would let Seattle Pacific University develop it, said Noah An, Johnson’s legislative assistant. A Major Institution Master Plan (MIMP) is developed by a major institution, a citizens advisory committee and city officials, and it identifies long-term planning and zoning rules that the institution follows. Institutions that have such master plans include hospitals, colleges and universities. Each master plan has its own major institution overlay. Seattle Pacific University’s last MIMP was adopted in August 2000, with work on its creation starting in 1998, said Dave Church, SPU assistant vice president for facility management. Because major institutions can’t expand into single-family zones, SPU was encouraged to look at expanding its campus to the north, south or east, Church said. SPU was later encouraged to liquidate its properties south of campus. The private Christian university sold its Robbins Apartments, 2701 Third Ave. W., to Bellwether Housing in 2012, and its two-acre tennis court and parking lot space near the Queen Anne Bowl to Aegis Living, which used it to construct its Aegis of Queen Anne at Rodgers Park facility. SPU used the proceeds to help fund a new performance hall. “We’ve largely pulled back down into campus within our existing overlay that you can see in that August 2000 plan,” Church said. SPU did also reinvest its proceeds into acquiring land north of West Nickerson Street, and the existing major institution overlay (MIO) extends to the Ship Canal Trail. “We’ve been trying to talk to the city and various neighbors about, would we be allowed to extend our MIO overlay into the industrial buffer land,” Church said. That would give SPU precedent to consider filing a letter of intent and go through another master planning process. “It doesn’t make sense to start that until we find out if we’re allowed to,” Church said. The assistant vice president for facility management said SPU knows it will need to eventually adjust its square footage as academic programming changes, and with older buildings in need of seismic retrofits. All Major Institution Master Plans require final approval by the city council. “Any such proposal must be thoroughly vetted through the City’s MIMP process, which involves years of negotiation and compromise in open meetings with the Queen Anne community, industrial lands stakeholders, and the city at large,” according to a statement from SPU. The council’s Planning, Land Use and Zoning Committee will hold a public hearing on an ordinance that addresses the industrial boundary change at 9:30 a.m. Wednesday, Dec. 5, in council chambers at Seattle City Hall, 600 Fourth Ave. Comments can also be sent to An at noah.an@seattle.gov.